Presidents Donald Trump and Vladimir Putin have met face to face for the first time at the G20 summit in Hamburg, Germany. They have discussed the alleged Russian hacking of last year’s US presidential election. Secretary of State Rex Tillerson described the exchanges as “robust”. And Russian Foreign Minister Sergei Lavrov said President Trump had accepted President Putin’s assertions that Russia was not responsible. However, Rex Tillerson said it was not clear whether the US and Russia would ever come to an agreement on what happened. “I think the president is rightly focused on how do we move forward from something that may be an intractable disagreement at this point,” the secretary of state added. Donald Trump and Vladimir Putin held their first face-to-face talks on the sidelines of the G20 summit, which is being held amid sometimes violent protests. Other topics discussed during their meeting – which lasted nearly two-and-a-quarter hours, longer than originally planned – included the war in Syria, terrorism and cybersecurity. “They had a very robust and lengthy exchange on the subject. The president pressed President Putin on more than one occasion regarding Russian involvement. Rex Tillerson said the two leaders had “connected very quickly”, adding: “There was a very clear positive chemistry between the two. There are so many issues on the table… Just about everything got touched upon… Neither one of them wanted to stop. Rex Tillerson was asked as he was leaving the news conference if this was accurate, but declined to answer. 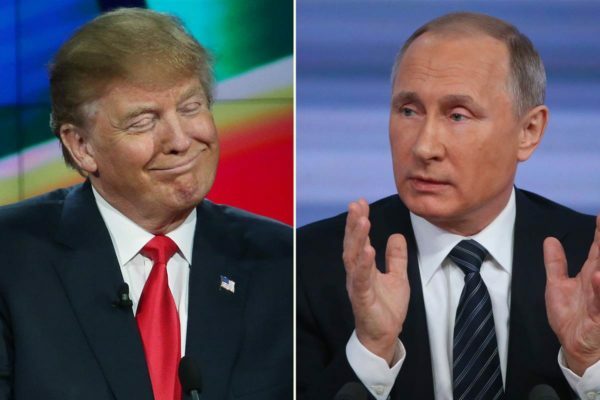 Donald Trump added: “Putin and I have been discussing various things, and I think it’s going very well. Vladimir Putin, via a translator, said that while they had previously spoken by phone, that would never be as good as meeting face to face. The G20 (Group of Twenty) is a summit for 19 countries, both developed and developing, plus the EU.